Pantry Pride, also known by its predecessor name Food Fair was a large supermarket chain in the United States. It was founded by Samuel N. Friedland, who opened the first store (as Reading Giant Quality Price Cutter) in Reading, Pennsylvania in the late 1920s. 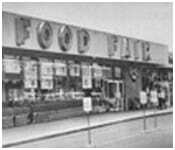 As of 1957, Food Fair had 275 stores, and at its peak, the chain had more than 500 stores. Friedlan’s family retained control of the firm through 1978, when the chain entered bankruptcy.